The holiday season is generally thought of as a time of joy and love, but for far too many people, it’s a time of loneliness. Some people live far from family and miss seeing their loved ones this time of year; others dread going to holiday parties and New Year’s Eve celebrations without a partner and end up staying home. It’s also common for people to feel emotional distance from the people they’re with, thus feeling lonely even if they’re in a room full of people. 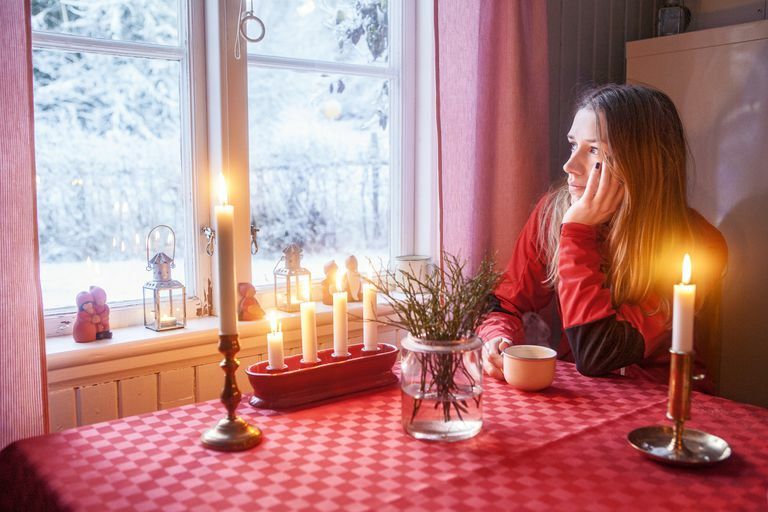 For those who feel a sense of loneliness during the holidays seson, this time of year can be a time of additional stress. If you’re experiencing loneliness that causes you to stress during the holiday season--or during holidays that fall at other times of the year, like Valentine's Day or even Independence Day, the following suggestions can help. While this may not completely erase feelings of loneliness, taking special care of yourself can help you to feel better and enjoy your solitude more. Whether you take a relaxing bath and give yourself spa treatments, curl up with a good book, enjoy a hobby, or learn something new, taking time to do things that will enhance your self esteem or at least give you a good dose of fun will not only take your focus off of feeling alone, but it can lift your spirits as well. While you may be feeling alone in your life right now, knowing that the holidays can be a lonely time for many people may help you to feel less so. (In fact, in a poll on this site, over half of respondents said they "usually" feel loneliness over the holidays, and only a small percentage said they "never" do!) Many people wish they could be with family, but can’t; others mourn the relationships with family that they wish they had, that they see others enjoying during the holidays season. Likewise, many people long for closer connections with friends, or wish for a supportive romantic relationship, and find themselves feeling isolated during the holidays. While it may be uncomfortable to feel lonely, it’s also okay to feel this way. Talking to others who may share your feelings (either via the internet or in real life) can help you to feel less alone in your situation. Part of why holidays feel more lonely for many people is that our society has high expectations for this time of year. The absence of a romantic partner or a close family rarely seems more uncomfortable than during this flurry of expected social activity when we’re all supposed to be going to parties and exchanging gifts and enjoying jolly feelings with loved ones. One way to deal with the feelings of loneliness is to re-think your expectations. Realize that few people’s lifestyles truly measure up to “movie standards” of perfect living, and shift your focus to all the great things you do have in your life. (Social media can create significant amounts of stress in this area; here's how to cope.) Realizing that it's just fine to take a good friend (instead of 'the perfect date') to a holiday party, or that the flawed love of a difficult family member still counts as love, has helped many people feel less lonely. As previously mentioned, it is possible to feel lonely when surrounded by people, but it’s harder to feel lonely when you’re reaching out to them. Whether you’re saying hello to neighbors you’re usually too rushed to acknowledge, exchanging friendly words with people at the office, or picking up the phone and calling an old friend you haven’t spoken to in a while, reaching out to people and strengthening bonds can help you feel more connected and less lonely. This may be a time to message people over social media whose statuses you usually simply "like," and catch up on old friendships. This article has more on meeting people and creating a circle of friends. There are many far-reaching benefits to gratitude. One easy antidote to feelings of lack is to cultivate feelings of gratitude for what you already have; it's hard to focus on both at once. If you're feeling a lack of love in your life, make a concerted effort to focus on the love that you do have--from friends, family, neighbors, and even pets. You can also focus on things you really value in your life, like your work, the hobbies you have, or even your potential. Maintaining a gratitude journal can be a wonderful exercise in cultivating an attitude of gratitude, and can leave you with a written record of everything you have to value in your life, to read through when you're feeling down. One particularly meaningful way to feel less lonely during the holidays is to donate your time to a cause you believe in. Helping others who are less fortunate than you can fill you with feelings of love and pride, remind you of all you have to be grateful for, and even connect you with others who share your passion. You’ll be part of something larger than yourself, and you’ll be immersing yourself in the true spirit of the holiday season. This one probably won’t make you feel better immediately, but if you feel lonely much of the time, this may be a cue that some changes are in order for the coming year. You may want to examine what’s behind your feelings of loneliness, either on your own or with the help of a therapist. Would you benefit from putting more time into your social life so that you have stronger relationships? Is something inside of you causing you to keep people at a distance? If you’d like to deepen your friendships, it can cost a little extra time and energy, but the payoff is having increased support and feelings of being heard and understood. Making time for friends, truly listening when your friends talk, and being there for them are all ways to build supportive friendships. This article has more on how to make your friendships more supportive. If you feel burdened by feelings of loneliness or feel them throughout the year and find it difficult to deal with, you can also talk to a professional about how you feel; this can often be more helpful than people expect.